Tualatin, Ore. — March 19, 2019 — CUI’s Power Group today announced the addition of Ac-Dc power filters, designed to accompany its existing portfolio of low power embedded ac-dc power supplies. The EMC‑20 and EMC‑30 series offer 20 dB and 30 dB of ac-line noise filtering at 150 kHz to 1 GHz, respectively. 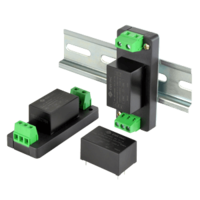 Available in compact board mount, chassis mount, and DIN rail configurations, the models ensure surge compliance to the IEC/EN61000-4-5 standard and reduce conducted and radiated emissions to help designs comply with CISPR22/EN55022 Class B limits. CUI’s ac-dc EMC filters further feature a wide input voltage range from 85 to 305 Vac and accept up to 1.5 A of nominal input current. A 2,000 Vac isolation voltage and wide operating temperature range from -40 to +85°C affords additional ruggedness in harsh environments. These ac-dc power filters ultimately provide engineers with a convenient modular solution for addressing EMC and surge challenges, while reducing the need for additional external components. The EMC‑20 and EMC‑30 series are available immediately with prices starting at $6.95 per unit at 500 pieces through distribution. Please contact CUI for OEM pricing. CUI is an electronic components manufacturer specializing in a diverse range of product technologies. As a leader in power electronics, the organization supports customers as they strive to improve the energy efficiency and environmental credentials of their application. The company’s interconnect, audio, motion and thermal management groups provide engineers with reliable and proven solutions across a range of market segments as technology allows the world to connect in new ways. An unwavering commitment to the design engineer has been a hallmark of CUI’s sustained growth since its founding in 1989 and will continue to be the primary mission as they expand their product technologies, manufacturing capabilities and global reach.